What a tournament! What a Shootout! We have 7 winners in the money, including a tie for 2nd place. Congrats to those in the cash. I’ll be in touch about payouts. Everyone else, thanks for playing! Check out the standings spreadsheet to see where you finished and how your team stacked up to the best possible picks. Phew. Just caught my breath after this weekend’s games. I need a cigarette or something, and I don’t even smoke. Anyway, the standings spreadsheet is up to date. We’ve got about 10 players with a chance to finish in the money and 2 with a chance at the big prize. I’ve added the remaining players for those top contenders right on the standings page to save you a click. Two rounds down, most of us eliminated from the big money. This is only the second time in modern NCAA Tournament history that all of the one, two, and three seeds survived the first weekend. It’s tied for the most chalk first weekend in the modern era as well. That means two things. 2. It’s really hard to separate yourself in the PBFS! See where you stand right here. I hope everyone enjoyed the first round of games. Plenty of teams are still in the hunt for the cash! Keep your eyes on the standings spreadsheet all weekend long to track your team and your chances to win. March Madness attracts so much attention from casual fans for a variety of reasons. Sure, the excitement and emotion are nearly unmatched in the world of sports, but what really gets everyone juices pumping is those brackets. Everyone wants to enter and win their pool, and really, everyone has the chance to do so. Even if they have not watched a single second of basketball this season, every person in your office has an equal shot of submitting a winning bracket if they understand the basic premise of the tournament. As a basketball fan, that probably bothers you. You studied! You know about NET and KenPom and mid-major conferences. You read Palestra Back, dammit! Why can’t there be a better way to prove your basketball prowess? Why can’t we take things a step further? Can’t we have more fun that a boring old bracket? We can! It’s called the Palestra Back Fantasy Shootout. To enter, you’ll chose one player from each seed line. 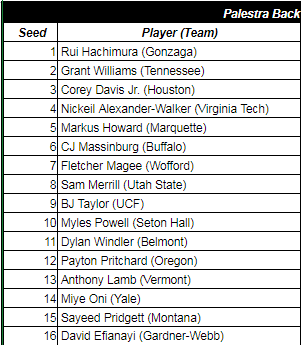 One player from any of the four number 1 seeds, one player from any of the four 2 seeds, and on and on, all the way down to the lowly 16 seeds. You’ll finish with a 16 player team (with each playing for a different seed). The team with the most total points (and only points, no rebounds or assists or other statistics) is the winner. Everything will kick off next Thursday with the round of 64, so no bonus points from guys in the First Four/play-in games. It’s a bit like playing Daily Fantasy Sports on FanDuel or DraftKings, but instead of choosing based on fictional player “salaries”, you are limited by their team’s seeding. But in tournament play, it’s more than just points per game because we don’t know how many games each player will play. Take a solid scorer from the team you think will win it all or the high volume shooter on the team that could be bounced after a few games? That’s the decision you’ll need to make. Now, it’s even easier to play and to understand. Go to the all new handy-dandy entry form and simply choose one player from each of the dropdown menus. THAT’S IT. Well, except you need to pay. WHAT DOES IT COST AND WHAT CAN YOU WIN? Entries will cost $20, with payouts being made to made to the top finishers (exact payouts and number of winners to be determined once all entries are received). Only one entry will be allowed per person. Paypal: Click RIGHT HERE to submit your $20. If you don’t have a PayPal account, it’s free and easy to set-up. Venmo: Send $20 to Shane-McNichol on the Venmo app. If you don’t have Venmo, it’s free and easy to set-up. If either of those options doesn’t work for you for whatever reason, send me an email (palestraback@gmail.com), message me on Twitter (@OnTheShaneTrain or @PalestraBack), or comment on this post down below. We’ll figure it out. WHEN AND HOW DO I DO THIS? Entries are open! Go to the entry form and submit your team whenever you’re ready. All of this must be done before 10 AM on Thursday, March 21. This is a hard deadline. If your team is not in yet, your money will be refunded. If you have not paid, your team will be removed from the contest. IS THIS THE EXACT SAME BLOG POST FROM LAST YEAR’S CONTEST, COPY AND PASTED?? No, it’s from 2016! You don’t care, you’re just here for the contest!